To enable Pozi users to access data, the data must first be published to web. The Australian Federal Government provides the data.gov.au portal for government organisations to publish their data. The specific requirements for data that you wish Pozi to access as a layer, please follow these guidelines. 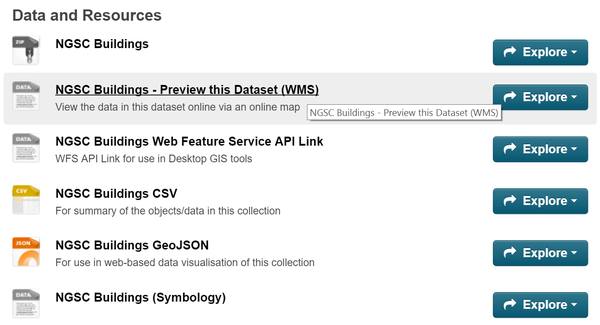 Click on the WMS preview to see a map of the layer. Check the layer styling (if required) and click on a feature to ensure it contains the up-to-date attributes. When uploading a CSV file you will prompted to specify a file type, and it is important that you specify csv as the file type, and not .csv or something similar. Incorrectly specifying the file type will result in the API interface not being generated as part of the ingestion process. If you wish to replace an existing resource with a new version ensure that whenever possible the new file continues to use the same structure. Developers and others are able to access the resource via its UID (eg: [ ad5c6594-571e-4874-994c-a9f964d789df]). So if you overwrite a resource with a new file which is formatted differently or a different file type (replacing .CSV with an .XLS) you will run the risk of disrupting applications which utilise the resource. So if you do plan to restructure your data, add the new file as a different resource to the existing dataset.